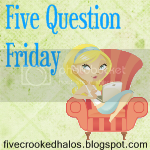 Welcome to Five Question Friday, courtesy of My Little Life blog! 1. Have you ever hit an animal with your vehicle? It's been a long time, but many a chipmunk has met his/her doom under the wheels of my car (s). I don't know what it is, but they're just drawn to me. I also hit a deer in college. Until about 8 years ago, I lived in a fairly rural area of Wisconsin, so there was plenty of wildlife mingling on or near the roadways. Technically speaking, however, the deer hit me. It picked the wrong time to cross the highway and bounced across the front of my car. It continued on across the road...apparently unscathed. Scared me half to death though, since it happened late at night. 2. When you see a string on your clothes do you pull it off or cut if off? This is actually one of my things. If I see a string, I have to cut it off. I'm compelled! On me and on those I love. Okay...even random acquaintances. 3. Did you have your own room or share a room when you were young? I have one sister and we always shared a room, right up until college. We were even roomies for a year in college, then again after school for a year...and for one more year, after she moved by me in Minnesota. Always one year increments, because it took me about 6 months to decide that I don't like living with her...and a few more years to forget it all and do it again! 4. Would you rather wear the same thing for the rest of your life or eat the same thing for the rest of your life? 5. What was your favorite TV show as a child? Mr. Rogers. Such a sweet guy! As I got older, probably Beverly Hills 90210. Dylan, Kelly, Brandon...where are you??? Happy Friday and have a fabulous weekend! Awww...those 90210 days were the best, weren't they?! You're the first "food for the rest of your life" answerer! Had fun reading your answers! !